W2E`s wind technology is the first technology worldwide which received a complete certificate based on the higher requirements of GL RC’s “Guideline for the Certification of Wind Turbines, Edition 2010”. The certificate was issued by the TÜV NORD Sys Tec GmbH & CO. KG. The certificate was issued for a 2.0 MW wind turbine with a rotor diameter of 93 m and tubular towers with hub heights of 85 m and 100 m. The certificate allows the turbine technology to be erected and operated in wind class IEC 2a areas. In addition to the technology portfolio of the turbine platform the certificate shall be enlarged at short notice for the larger rotor diameter of 100 m for wind class IEC 3a. Furthermore the certificate shall be issued for two lattice towers in order to operate in hub heights of 120 m and 140 m.
This technology can be bought by potential customers in license and cause a technological lead over competitors. W2E licensees mainly act on the international wind market. 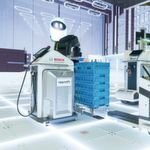 They have the opportunity to obtain besides the technical documentation all necessary certifications and get access to the supply industry in the form of cooperation. As a result of this a fast market entry is ideally prepared from a design and development point of view. Especially in the Indian market the “Guideline for the Certification of Wind Turbines by GL, Edition 2010” is required by the certifier C WET in order to be registered as wind turbine manufacturer and to start a successful business in this field. W2E was able to meet the requirements on time and customer oriented as well as to use its own innovative power. The certificate was issued in close cooperation with the supply industry and by means of precise accords between licenses, certifier and W2E as developer. As result of these accords, the certificate was issued contemporary and in accordance with the erection plans in India and Germany. Particular attention should be paid to the long lasting and good cooperation between W2E Wind to Energy GmbH and TÜV NORD sys Tec GmbH & Co. KG. This cooperation can be considered as base for the fast achievement of the type certificate. 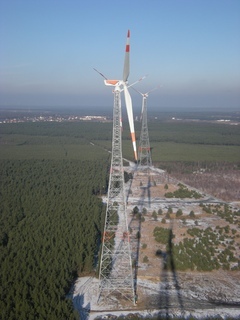 W2E Wind to Energy GmbH (W2E) develops multi-megawatt class wind power plants. That is, W2E’s specialty is in conceptually designing and developing entire wind turbine systems. W2E select suitable rotor blades, optimize control strategies and specify the design of an appropriate pitch system, drive train, energy conversion system, tower and foundation. Additionally, W2E service includes fully certifying, operating and comprehensively testing the prototype of each new development. The result of the highly specialized design is offered to international customers as licenses. 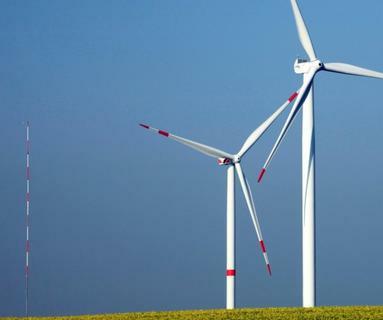 W2E deliver this product as a comprehensive set of documents which enable the licencee to manufacture, install, commission and maintain the wind power plant. Documentation comprises all calculations, proofs, certificates, part lists, specifications, descriptions and drawings, including training documents. All of our documentation complies with an established quality-assurance system. 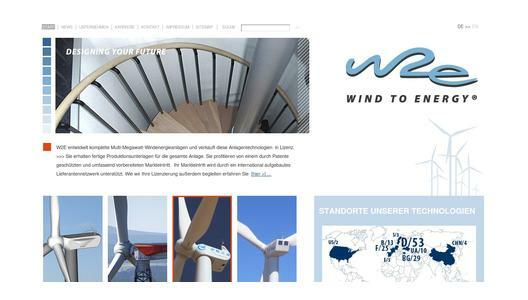 W2E Wind to Energy GmbH was founded in May in 2003. The number of employees increased from 7 to 30. A subsidiary was established in canada. W2E has customer relationsships to german, chinese, indian, korean and american companies. The product portfolio offers turbine plattforms for 1.3 MW, 2.0 MW, 2.5 MW and 3.0 MW.